I have reported earlier on the Only Watch event in Monaco this coming september. Maximilian Busser introduced his special version of the Horological Machine No2, in order to get attention and financial help for kids suffering from Duchenne Muscular Dystrophy. And although the goal is noble, I really think some of the contributors should have tried harder. This evening, I noticed the contribution by Omega on Roger Ruegger’s website and I was amazed by the laziness of this company from Bienne. The good thing about this watch is that it has the new inhouse Omega movement, Co-Axial 8501 and that there probably are people who are going to spend a lot of money on it for the benefit of DMD. However, what on earth (or moon or mars) was Omega thinking? Although Omega has a special place in my collector’s heart (hence the Speedmaster coverage here), these kind of additions to the Omega collection makes me sad. A women’s watch measuring 55.5mm x 17.5mm, what’s that about? This is one of the most silly watches released this year. 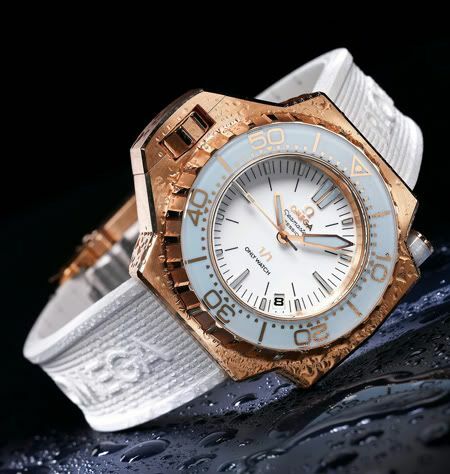 A diver’s watch that can go as deep as 1200 meters below surface, in 18kt red gold. Nice. The only thing missing here is the tourbillon. No wonder this is a one only watch. Nevertheless, I hope the watch gets sold for a nice price (to whoever with a bad taste or to someone who just cares about the auction event and not about the watch) and that Omega learns from their mistakes and contribute with something more decent next year. Some of the other contributions to the Only Watch event in Monaco are quite impressive, like the Patek Philippe Celestial or the Girard-Perregaux ww.tc Ceramic or of course my favorite, the MBandF HM2. Omega could have done much better, they really gave me hope during the last BaselWorld with their new Seamaster PloProf 1200. Why didn’t they take the opportunity to show what they are capable of? They have made so much nice and exclusive time pieces in the past, besides the regular Seamasters, Speedmasters and Constellations. For example, they made a very spectacular Speedmaster with skeleton dial in the past or a dress watch with a tourbillon. Why not now? Is it the financial crisis? Or were they just lazy and thought “look how popular the Chanel J12 is, so why not go with that?”? I really don’t know what they were thinking, but I think the marketing guy responsible for this watch should get fired.